Novelty soap maker Geeksoap has a new line of bars - they can't market them as NES, Super Nintendo, or Gameboy cartridges, trademark reasons. But that's obviously what they are. 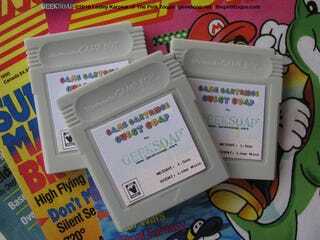 The NES and Super Nintendo soap are $6.50 , weighing eight and nine ounces respectively; Game Boy soap is $2, weighs 1.5 ounces and more suitable as a travel-size or guest bar. Then again, why you'd want to use and ruin these is beyond me. And if that's the point, why not just stick a real Super Nintendo cartridge in the dish in your guest bathroom?